"In Praise of Older Buildings"
Yesterday I had the incredibly humbling experience of standing on holy ground...well, on the ancient worn floor boards of an historic church seldom accessible to the public. It was open thanks to Orland and Sylvia French, members of a group of volunteer curators who reside on site during the summer and open the church to chance visitors and pilgrims alike, anyone fortunate enough to visit this bucolic bit of Lennox and Addington county, steeped in history. The opportunity to wander the property is available year-round - plaques explain the church's worthy history. 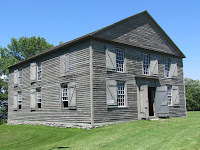 When the curators are present, you are invited to enter, to examine displays or purchase some fine historical resource material, to marvel at the beautifully crafted replica pulpit and soundboard, to climb the sturdy worn stairs to the gallery and look out over the simple New England meeting house interior and the views of bright water beyond the plain sash windows. The building is a tribute to the faith and the labours of our pioneer ancestors, who survived the refugee experience as Loyalists, carved farms from the wild country, raised families against great odds, and maintained their faith in the face of life's joys and calamities. The Hay Bay Church was built in 1792. 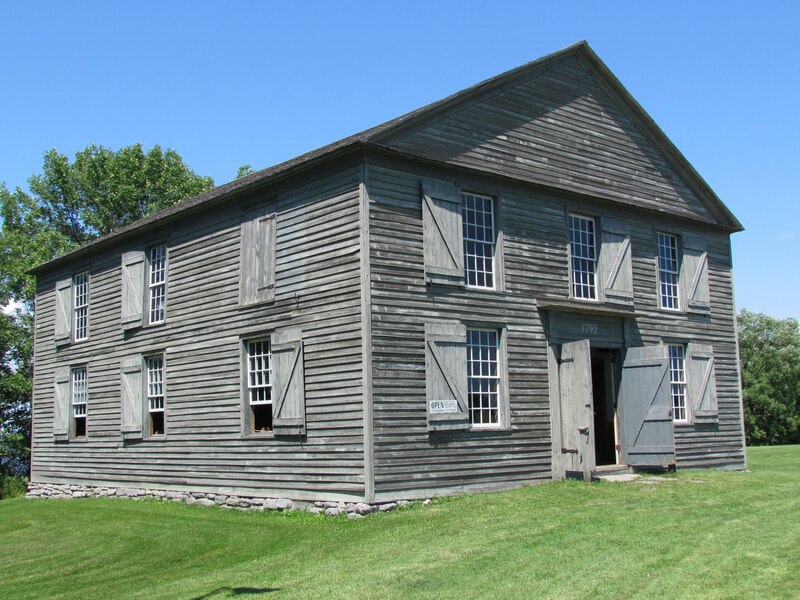 It's a National Historic Site, Canada's oldest Methodist building, where circuit preachers once thundered from the high pulpit. There is an annual service, this year on August 28. 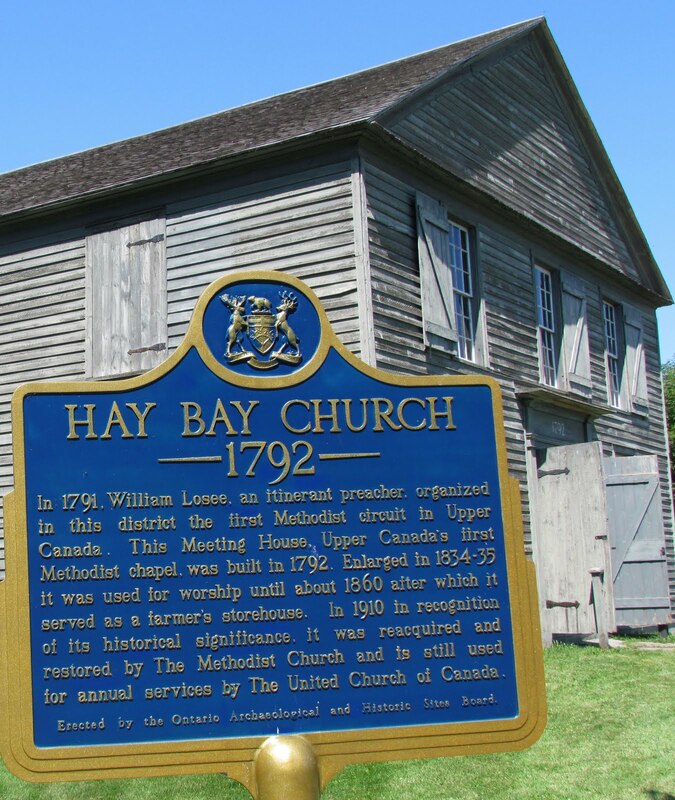 The Hay Bay Church story is kept alive by dedicated volunteers of many kinds, and by historians, clergy, genealogists and UEL history seekers, pioneer history buffs, and folks who love old buildings. It's a miracle that it survived. 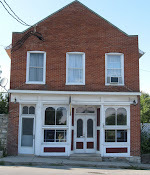 As the early Methodist church evolved, the building was sold to a farmer for use as a storage building, in 1867. The church was purchased and restored by the Methodist Conference of Canada in 1912 - a very early recognition of the importance of the Methodist and Loyalist history of the region, and of our historic structures. Bless 'em. I virtuously avoided purchasing any of the wonderful resources on offer, thinking that I had ample material among the church histories given to me by my mother. Finding none, I am already planning a return trip to get a copy of the newly published book 'The Founders', the story of the 22 persons who founded the church, written by William Lamb, a Past President of the Canadian Methodist Historical Society, and historian of Old Hay Bay Church. 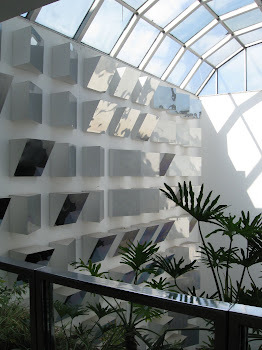 I'm looking forward to that, and to just standing inside the meeting house door again, being in a holy place. And, it would turn out, in a place deeply connected with my story. I have a little certificate that once belonged to my father. It is dated August 1926, written on the occasion of the Huff Family Historical Association's 150th anniversary, It states that he is a descendant of Solomon Huff. It was a Paul Huff who donated the land for this church. I expect they're connected. Looks like we're connected. Another reason to be drawn to this place. Do not feel free to use text or photos without contacting the creator for permission. 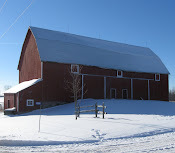 Ancestral Roofs is my online journal celebrating the built heritage of Ontario. Fort William Collegiate Institute - "they don't make 'em like they used to"
Eaton's catalogue house, Sceptre, Alta. 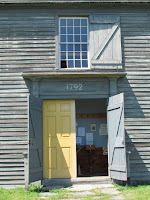 Zwicker House, Mahone Bay N.S. Vanishing symbol of the west, Wood Mountain, Sask. 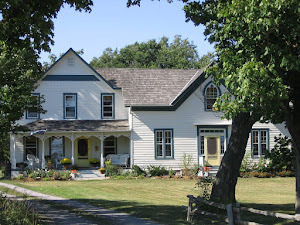 The (Alex) Colville House - Sackville N.S. copyright ancestralroofs. Watermark theme. Powered by Blogger.